Everyone feels sad, low or just disinterested every now and then. Feelings of sadness and sorrow are normal, and where appropriate, healthy and a necessary part of life. Such depressive episodes, in the regular course, often allows us to value what we have when we have it, cherish the good things and through the sorrow and sadness, we often get in touch with a deeper sense of what it means to be alive and come back to the business of living. For some though, the sadness refuses to go away, or appears for no discernible reason. Yet others might just not feel anything, or there is a sense of apathy and no energy. For a few, there might be anger and aggression that seems a persistent state. Such feelings and associated thoughts, might affect how one eats, sleeps, works, relates and just lives. The persistence of such a state, where one begins to feel hopeless and helpless can be clinical depression. “One of the primary reasons we have emotions in the first place is to help us evaluate our experiences” - Adler. Sometimes, people going through a depression may also have suicidal thoughts or actively consider suicide. If such thoughts occur, even in the fleeting, please do talk to a mental health professional at the earliest. Call a helpline like Sahai (+91 80 25497777). Often, we find that people use 'I am depressed' when they really mean 'I am sad.' It is important to differentiate the two. Sadness is a necessary emotional state, and though there is such a social pressure to not be sad and be happy always, it is OK to be sad when needed. Going through the sadness can be a life-enriching experience. When one is clinically depressed, it does become very hard indeed to help oneself. Professional help, including medical help, may be needed to even get the jump-start needed to be able to work yourself out of it. When you can, start with the smallest things you can do, even with the limited sense of your resources. Perhaps get a bit more regular in your daily routine, or add a short walk, or sit under a tree in the sun in a park close by. Getting up and moving is one of the biggest help you can give yourself. As you get better, make it more of a fun exercise. Make sure you are eating healthy - as well as you can. You may not recognize it when depressed, and yet, being able to seek out supportive relationships, be it with friends of family, or even strangers can help. Seek out support groups if available. Let someone you trust know how you feel, and tell them you just want their support - not their advice or guidance, just support. Talk about things. Thirdly, start monitoring your self-talk. Notice if you are generalizing current negative state into "Things will never improve," or "I am always like this," and challenge yourself. Correct yourself to say that this is temporary. Remind yourself you have felt better before and could feel better again. Learn from a mental health practitioner on other negative thought patterns and consciously work on it. 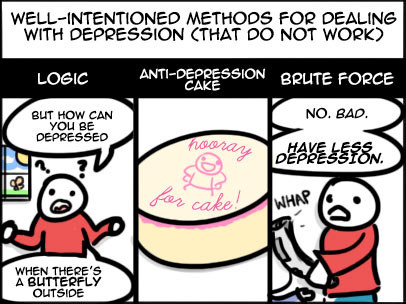 How can you help a depressed person? For many, is hard to see depression as an illness and requiring attention, treatment and focus, rather than to see it as willful laziness. Even when well-meaning, there is a tendency to ask that depression be shaken of, or to 'get over it already,' or 'deal with it.' What helps is a caring presence, ability to listen without judgment and having the rapport to influence the person to seek treatment, and following up. Help with small things - be available for walks and long talks, help them argue with themselves against their negative thinking, keep a tab on them, check in now and then. ​If you find it overwhelming to support them, seek advise yourself on how you can help. If you have been showing signs of depression for more than two weeks, please seek out help. If you find yourself getting thoughts about hurting yourself, or killing yourself, or just thinking that things will be easier for others if you weren't around, please call right away and talk to a counsellor.